On Friday morning when I was writing my post “Why I have Bees” I thought I should add a photo of the Blackberry flowers because the bees help in their pollination. 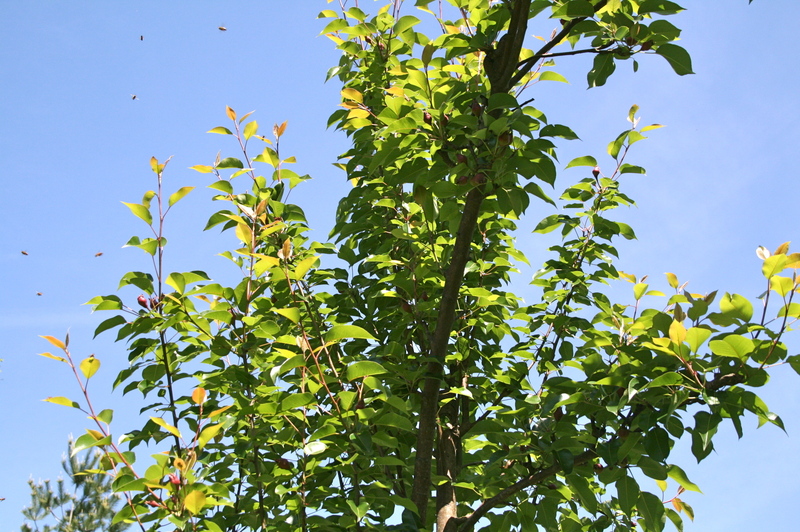 So, I grabbed the camera, put on my down coat and headed out to the orchard. It was a beautiful sunny morning, but chilly around 40 degrees. The dogs escorted me out and I took a few pics of the blackberries, took a peek inside the hives and thought I might take another few pics of the Pear and Peach trees so I walked on over and aimed my lens at the top of one of my pear trees and guess what? There looking down at me was a huge swarm of bees. 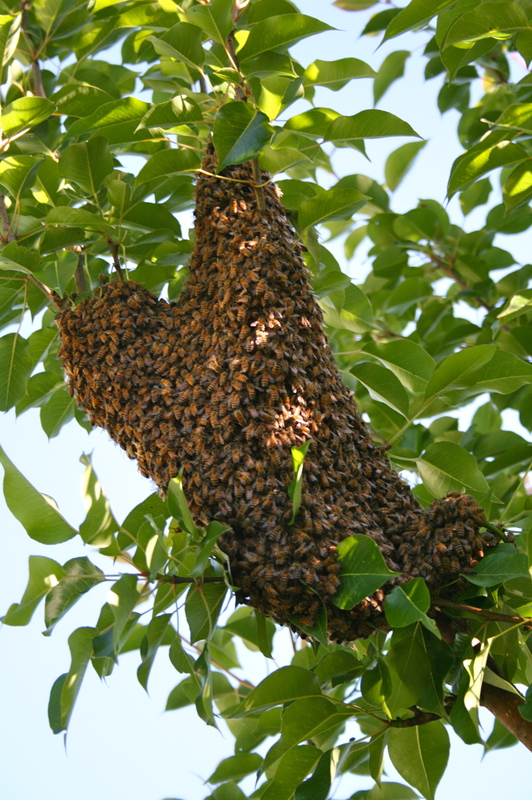 Now I know its bad when bees swarm, but I was overjoyed, giddy,and you could say thrilled! We had set up and kept an empty hive box to place a swarm when Liz captured one. I had asked Liz to call me when she went to pick up her next swarm so I could tag along and photograph the procedure to share here with you. Here in my own backyard 10′ away from the waiting empty hive was a swarm. 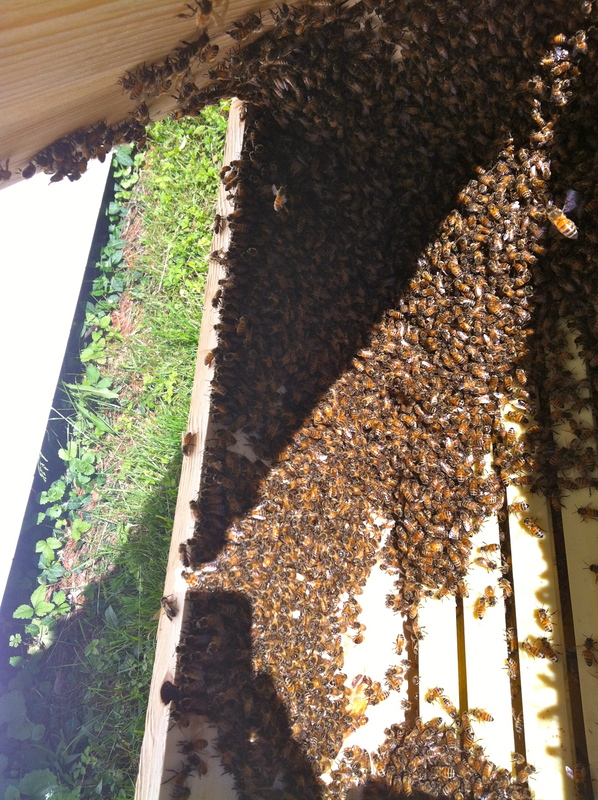 Of course, I took a pic on my phone sent it to Liz and hoped she could come over and take care of the swarm. I went in the house and downloaded the pictures I took to see if they were any good and waited to hear back from Liz. I soon learned Liz was out of town and it was up to little old me to get the swarm in their new home. I watched a quick youtube video to see how it was done, enlisted my hubby to photograph while I did the operation, put on my bee suit, grabbed the ladder, a bucket, and our loppers and headed back out to the swarm. 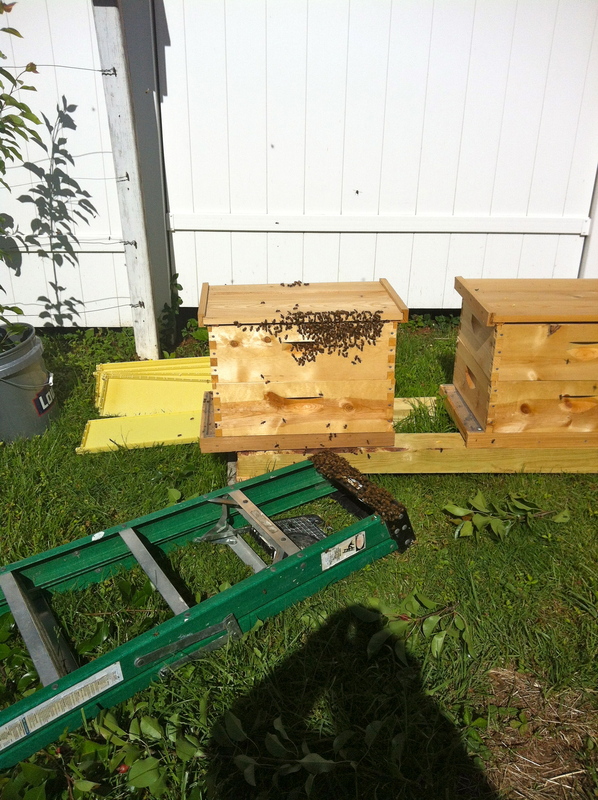 I emptied out the frames of the top box on the empty hive and laid them and the lid off to the side. Now it was time for operation swarm removal! I was fired up! I know I am a little weird! So, I head out to the swarm, I set the ladder under, placed the bucket on the paint shelf directly beneath the swarm (to catch any bees that fall off). Made sure my husband was taking pictures. Grabbed the branch below swarm with my left hand, placed the loppers around the branch below my hand using my side I pushed the loppers closed and held on for dear life to the branch. I dropped the loppers to the ground and VERY, VERY slowly lowered the branch to the bucket. Made sure my husband was getting the pics. Holding on to the top of the branch with one hand and the bucket with the other I SLOWLY walked over to the empty hive. Using the top of the branch I lifted the swarm out of the bucket sat it in the empty hive, cut off the top branches above the swarm (to help fit it into the hive box), made sure my husband was getting the pictures and lifted the branch about a foot in the air and very quickly and violently knocked the branch down to dislodge the swarm into the empty hive. There was a big swoosh and I was left holding an empty branch. I kid you not, the whole swarm fell right into the box! AWESOME! I asked Jim, did you get that shot, “YES” he said. You can imagine how he said it! Have I told you I have a very patient husband? Well, I do! 😉 He’s even allergic to bees, so he says. I was pretty pumped! My first swarm all by myself and it went off without a hitch. I put the empty frames back into the top box and closed the lid. There were a few bees hanging on to the top of the ladder, probably because it was cold and the black on the ladder was holding heat, so I sat it near the new box in hope that they would find their way in. Mission complete, I gave my very patient husband a big kiss thanked him for helping and ran into the house to download my pictures. Have you figured out what I did wrong yet? Yep, no freaking memory card in the camera, it was sitting at my computer when I came in. Now I am sure you can imagine the nasty words that came out of my mouth. In walks the patient husband, and what does he do??? Laughs! Now, you can imagine the nasty words that came out of my mouth! 🙂 Want to know how many times he has asked me if I have my memory card in? Ha Ha, he’s a comedian! Anyway, I did take a few pics after so I will share them. Tree after the removal. A few ladies flying around looking for their queen. Great so nice to hear other swarms happening, well done, I hope you have many more wonderful swarms from your bees.